Beyond simple composition analysis, the final properties of your material are determined by the chemical state and bonding of the atoms in the material. 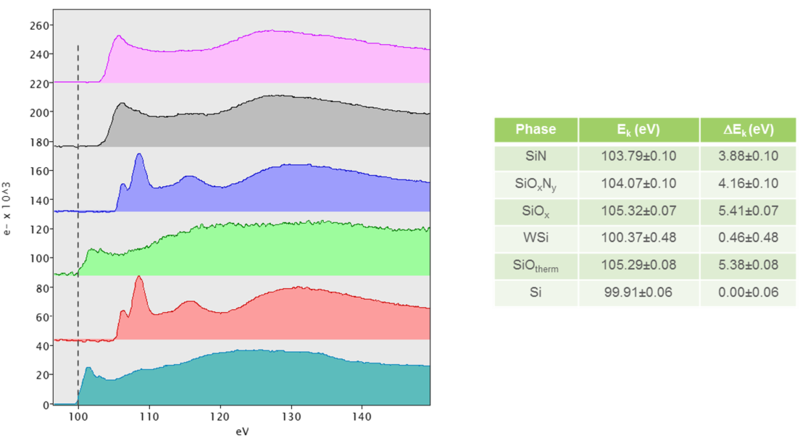 Learn how the strong coupling of the local density of states to the EELS signal enables you to determine the chemical state of your elements. ELNES & EXELFS represented on spectrum. 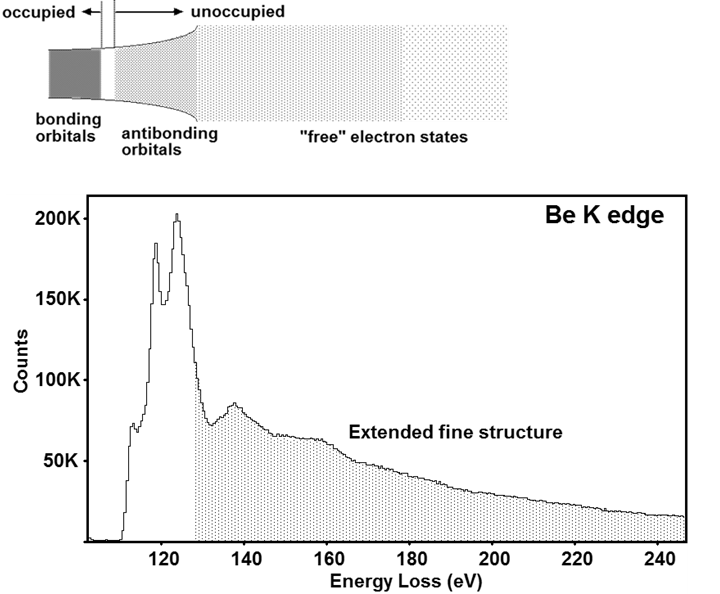 You can accurately deduce the chemical state of samples by analyzing the energy loss near edge structure (ELNES), which directly relates to the density of unoccupied states. 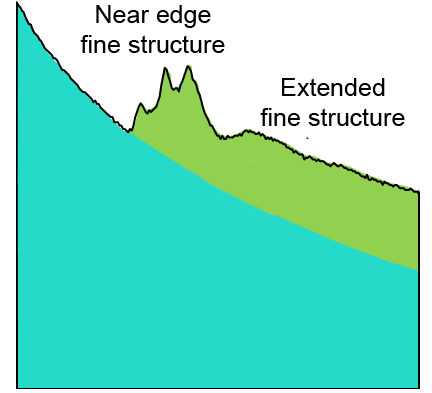 The atom specific radial distribution function (RDF) is directly related to the extended energy loss fine structure (EXELFS). Initial core state is localized to a particular atom, thus greatest overlap occurs with unoccupied outer-shell orbitals at that atom. Under the dipole approximation, the initial and final states must differ in their quantum state number (l) by ±1. For example, ELNES of a K-­edge (initial s-state) will couple to p-­like final states, while ELNES of an L-­edge (initial p-state) will couple to d­-like or s-like final states: ELNES of a K-edge (initial s-state) mainly features p-like final states, while ELNES of an L-edge (initial p-state) will mainly feature d-like final states. In anisotropic crystalline materials, ELNES changes with the alignment of the momentum transfer along different crystal axes. Redistribution of valence charge will alter core level screening, and thus change the potential energy of initial core states. The final energy states will change depending on the band structure of the material (e.g., Fermi level shift or opening of a band gap in the material). Both of these effects will cause the edge thresholds to shift. "Accurate chemical shift measurements using a post-column spectrometer equipped with an experimental electrostatic shutter." G. Kothleitner et al., EDGE Banff 2009. The extended fine structure represents transitions from the core level to states above the vacuum level. This creates a source of free electrons in the material centered at the interacting atom. These electrons scatter and interact giving rise to interference terms in the tail of the scattering.